5 Ways to Know You Have the Right Printing Company! Most people are happy with the printing company they have and are happy to not rock the boat. Some, though, are ready to improve and find a better option. Here are five things to look for when trying to improve that process. 1. They answer the phone. As simple as this sounds it is becoming more difficult to get a human to answer a phone. Business is clearly moving more online and transactions are improved by being automated but when there are questions often times it just makes sense to talk to someone. 2. They get you accurate quotes in one day. Quoting is a science that involves multiple factors. A quality quote is the result of accurate material prices, like paper and ink, accurate equipment speeds and costs, and accurate outside services. If only one of these factors is misquoted then a price is either below market value or above market value and both of those are problematic. 3. They get you proofs in one day. In order to get a proof in a day, a company has to be able to enter an order, plan an order, have multiple people touch the order while still doing value added work. When a company is well managed and people are well trained then proofs can be turned on one day. 4. They deliver when you expect. 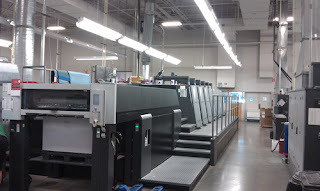 Printing is custom manufacturing and custom manufacturing is full of variables. Variables are the enemy of accurate delivery because a project can get off track and that can cause a missed delivery date. Your company has to have tight procedures and well trained people to keep everything running smooth. 5. They send an invoice that matches the quote. Many print projects are quoted, then days or weeks go by, then art is prepared, and then the project is produced. This timeline could be weeks from quote to delivery. A quality printing company has tight procedures and follows those procedures so quotes and pricing is tracked and invoices are accurate. The right printing company lives by these five beliefs and is constantly training and improving to delight a customer. Hopkins Printing has spent over 40 years improving our processes and systems to enable us to hit these five areas. We would love to show you how we can perform.